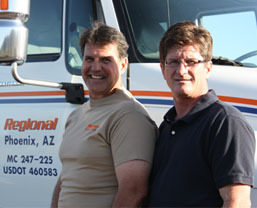 Regional Relocation: The Arizona Business and Commercial Mover. How does Regional charge for its moving services? Can Regional provide you with a move estimate? How does Regional estimate the cost of our move? Can Regional work around a set schedule (I.E. tenant improvement / reconfig)? How does Regional identify placement of office goods at the destination? Do we pack for the move or does Regional do the packing? Do we need to pack our file and storage cabinets? Can Regional disconnect, move and reconnect our computers? Can we provide a COI (certificate of insurance) as needed? Can we purchase moving insurance? In the event that we choose not to use Regional insurance how would any accidental damage be covered? Does Regional provide professionals to move our items? Do the movers show up on time? Does Regional have the expertise and know-how to handle all issues that may be presented during the move and complete on schedule? What equipment does Regional have available for our move? What area does Regional provide its moving service to? How does Regional accept payment? Is there a warehouse available for storage? Regional provides services at an hourly rate based on the amount of men and trucks needed to provide a professional moving service. Yes, at no cost to you we can survey and estimate any move. We will set an appointment at a convenient time at your location to survey all furniture and other items you want packed and moved. We will then quote the job in writing and mail, email, fax or hand deliver an estimate. Yes we can, In the event we cannot we will let you know as soon as possible. Regional provides color coded labels to be placed on all goods being moved per the floor plan and numbering system we use. Employees should pack their workstations or office area. Unless packing service is requested by you the client. If you have a filing system or banks of files we can provide a packing service for you if requested. So cabinets are not damaged in transit we request that the top two drawers are to be packed into cartons. All storage (wardrobe type) cabinets should be completely packed into cartons. Yes and they are typically issued to building management. If it needs to be issued to someone else we can accommodate. At no charge to the customer. Yes, at a $12.00 premium per 1,000.00 dollars declared value of the goods being moved. For any one article our insurance responsibility is .10 cents per pound, per item. Yes, we do NOT hire out day laborers on any of our projects. Ninety- nine percent of the time yes, unfortunately sometimes we cannot make provisions for traffic delays or a previously scheduled job running longer. We do not overbook moves! Yes, Regional has been moving businesses commercially in the valley since 1982 during that time our employees have been faced with some tough tasks and always been able to complete the job above the expectations. What equipment does Regional have available four our move? Our equipment consists of: RENT-A-CRATES (and or boxes), four wheel dollies, computer carts, refrigerator dollies, hand carts, johnson bars, pinch bars and rol-a-lifts as well as other specialized equipment. What areas does Regional provide its moving service to? All of Arizona, Intrastate moves are always completed by our employees. National moves can be shipped third party to anywhere across the USA. In addition we can pack and ship or crate UPS or FedEx as needed. We accept Check, Visa or MasterCard. Yes we have an air cooled warehouse. With short and long term storage available. Since 1982, Regional Relocation and Warehousing Inc, of Arizona, has been the preferred relocation specialists for thousands of large and small enterprise level businesses. "When I first called Regional until the end of my move things went flawlessly. Marty was impressively thorough on the survey and extremely detailed with his proposal, the move went off with out a hitch and all of my items were taken care of with the utmost consideration to prevent damage." Mike and Kendall really worked hard and took no breaks during the move and did not stop until everything was in its place at the destination and up to my exact requirements. Copyright 2018 Copyright Regional Relocation and Warehousing Inc. All rights reserved. Regional Relocation and Warehousing Inc.